Heat oven to 450°F. Place 1 pie crust in 9-inch glass pie plate as directed on box for One-Crust Baked Shell. Bake 9 to 11 minutes or until light brown. Cut second crust into 1/2-inch-wide strips. Line large baking sheet with cooking parchment paper. On baking sheet, weave strips together to make lattice design; trim to fit top of pie. Bake 7 to 8 minutes or until golden brown. Meanwhile, place pears in large saucepan; sprinkle with lemon juice. Add 3/4 cup sugar and the water. Cook over medium heat until pears are tender and almost all liquid has evaporated. Cool slightly while cooking cream filling. In medium saucepan, beat egg yolks with whisk or fork. Stir in 1 cup sugar. Add cornstarch and salt; mix well. Stir in 1 1/4 cups milk, the evaporated milk and 1 1/2 teaspoons vanilla until blended. Stir in butter. Cook and stir over medium heat until thick and bubbly. Spread fruit filling in cooled baked shell. Spread cream filling over top. Carefully slide lattice top onto pie. Cool; refrigerate 4 hours or until filling is set. In chilled medium bowl, beat all topping ingredients with electric mixer on high speed until stiff peaks form (do not overbeat). Pipe whipped cream around edge of pie, or garnish as desired. Store covered in refrigerator. Sweet Success Tip Use a pastry cutter (also called a pastry wheel) to cut the lattice strips for a special touch. 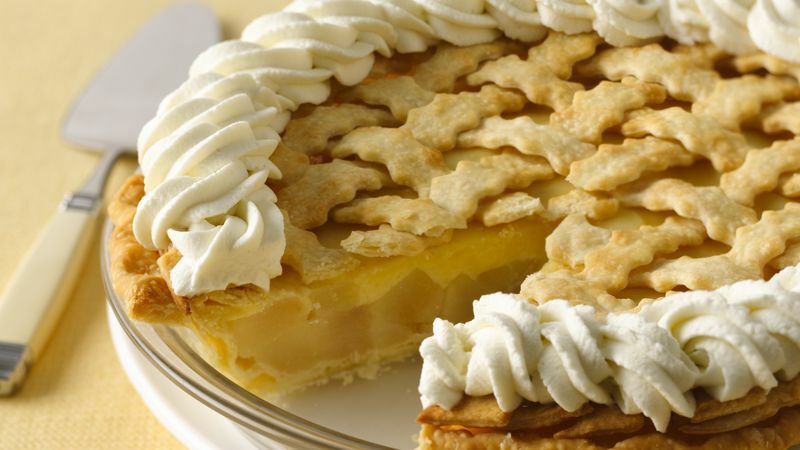 Bill Blake of Star City, Arkansas, won the Pillsbury™ Refrigerated Pie Crusts Pie Baking Championship at the 2009 Arkansas State Fair with this recipe.